So in the world of the traditional woodworker, there are long hand saws typically used for dimensioning stock, joinery saws used for cutting the various kinds of traditional joinery and making other precision cuts, and turning saws used for cutting all kinds of curves. Nicholson discusses nine different saws in his book. In fact, if you cross reference Nicholson’s book and Smith’s Key, you would end up with 4 long saws, 4 joinery saws, and 3 turning saws. That’s a total of 11 saws, which begs the question, how many saws does one really need? At a minimum, a traditional woodworking shop should have one large hand saw for breaking down and dimensioning stock, and one joinery saw. Well, like a lot of things, the answer is, it depends. I hate this kind of answer, but in this case, it’s how we need to approach the discussion. That’s because we all work differently and we all have different needs. But let’s start the discussion with the assumption that you have nothing at all; no other way to cut wood. If you’re just starting out, and you literally have no saw, hand or power, then I would recommend a basic pair of saws. In fact, if you were of the true minimalist mindset, you could make do with these two saws alone for a lifetime of woodworking. They may not be the most ideal or most efficient saws for every situation, but they would suffice for a lifetime. I would start with a crosscut saw. It’s up to you and your space restrictions whether you prefer a full length saw or a short panel saw, but you should get one, good unbacked hand saw for crosscutting boards. I prefer full sized saws if space is no issue, but plenty of people like shorter saws just as well. I’d recommend it have between 8 and 10 points per inch, and that it be filed crosscut with fleam. This will be your workhorse saw. You’ll use it for breaking down long boards, for final dimensioning of large panels like table tops and case sides, and all kinds of general sawing around the shop. While the saw wouldn’t be ideal for ripping, it would serve in a pinch, and could be filed with a bit less fleam if you decided to rip a bit more often with it. But let’s face it, VERY few woodworkers, no matter how dedicated to working by hand they are, do a lot of long ripping with hand saws. So in the long run, a crosscut saw will likely be much more useful to you. The second saw I would add to your kit would be a 14″ backed saw. You can call it a tenon saw, or carcass saw, or sash saw, or whatever else you’d like to call it. But it should be 14″, and it should have about 12 to 13 points per inch, filed crosscut, but with minimal fleam, maybe only 10-15 degrees. It’s very rare that I say a saw should be a specific length, but in this case, I’m sticking my neck out there and saying you should go with a 14″ saw. I’ve owned and used saws like this in 12″, and I currently own and use saws like this that are longer than 14″. However, the 14″ size is the most practical and versatile size for typical furniture work. This saw will be your joinery and precision saw. It will cut rails and stiles for cabinet doors to length; it will size your drawer stock; it will be used to saw shoulders, cheeks, and dovetails; it will define the walls of dados and sliding dovetails; and it will cut your sub sandwich in half. There is almost no precision sawing task that this saw isn’t capable of. Keep it sharp, and use it well. There is no more versatile, all purpose joinery saw than a basic, 14″ backsaw with about 12-13 points per inch, filed crosscut, with 10-15 degrees of fleam. There is no joinery this saw can’t handle. If you have a power saw for the rough operations, the 14″ joinery saw is probably the only hand saw you’ll need for the rest of your woodworking life. With the exception of a power miter saw (most of which can only crosscut), most power saws, whether it’s machine based, like a table saw or band saw, or hand held, like a circular saw or jig saw, can be used for all of your rough crosscutting and ripping operations. But what if you want to be a bit more efficient and you aren’t opposed to adding a few more saws to your kit? 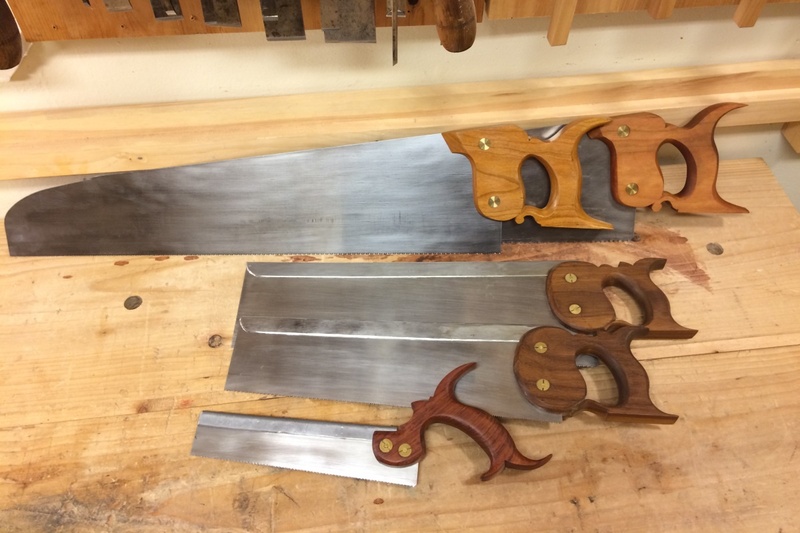 What is the ideal nest of saws for a traditional woodworker? Well, after working for many years with all different kinds of saws, in all different lengths and tooth configurations, I have whittled my personal collection of saws down to just 6 essential saws. With these 6 saws, I can do every task that a traditional woodworker needs to do, and I can do them all very efficiently, with minimal effort. So here are the six saws that I use on an almost daily basis. My personal nest of saws that I use for all of my furniture and joinery work (I also use a 12″ framed turning saw that is not pictured). Full Length Rip Saw – Mine is 24″ long, but you should fit the length of your saw to your height and the length of your saw stroke. I like a rip saw with about 5 points per inch, and I file mine with about 4 degrees of rake. This saw efficiently rip cuts any wood species, in thicknesses 6/4 and less. Full Length Crosscut Saw – Again, mine is 24″, but you should size your saw to you. I like a saw with 10 points per inch as this is aggressive enough for breaking down stock, but fine enough for final dimensioning crosscuts on large panels. I file this saw with 15 degrees of rake and 25 degrees of fleam. Tenon Saw, 16″ – This is my larger, rip filed joinery saw. This saw doesn’t see as much use as my other joinery saws, but when I have a bunch of tenons to cut, this saw comes out to saw the cheeks. And usually, when you have one tenon to saw, you have eight tenons to saw, so this saw lets me work tenon cheeks efficiently. It has 11 points per inch, and is filed with 4 degrees of rake. 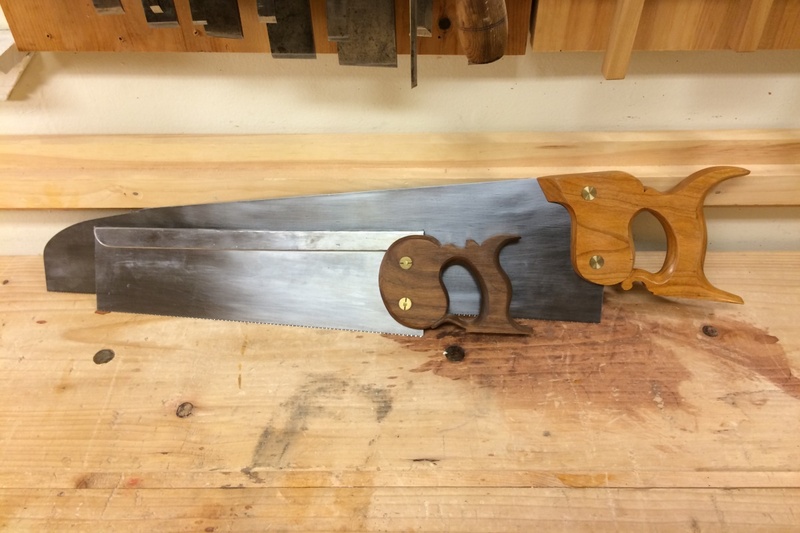 Sash Saw, 14″ – I refer to this saw as a sash saw to distinguish it from my larger, rip filed tenon saw, but it’s similar in style to my tenon saw, just 2″ shorter, and the blade isn’t quite as deep. I file mine crosscut with 15 degrees of rake and 25 degrees of fleam. 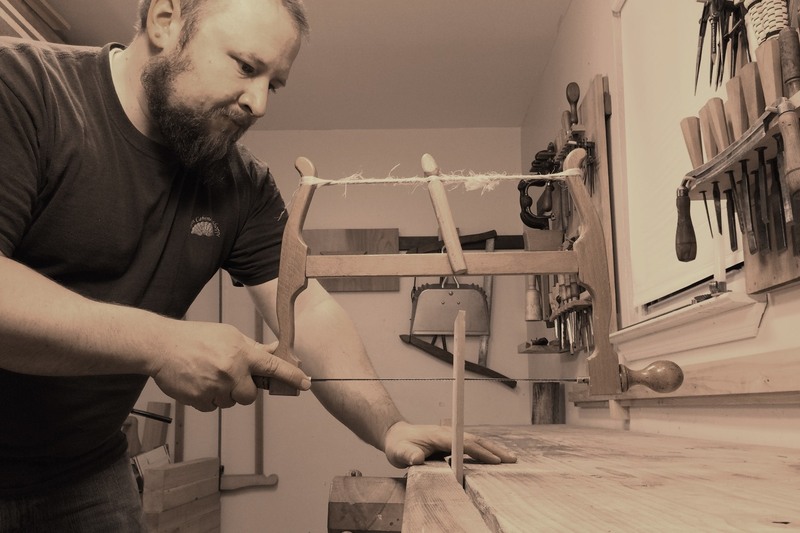 I use this saw for precision crosscuts, tenon shoulders, and even cheek cuts in small tenons. Dovetail Saw – I use this saw for sawing dovetails in drawers and case sides. Maybe occasionally for really small tenons, but not very often. Mostly, it’s dedicated to cutting dovetails. It’s 9″ long, with 17 points per inch, filed rip with 0 degrees of rake. Turning Saw – This is the saw I use for all of my curved work. The blade is 12″ long and has 10 points per inch. It is light weight and nimble and beats the pants off of any coping saw I’ve ever used. My turning saw is an antique 12″ model that I’ve retrofitted with a modern blade. It’s the only saw I need for curved work. 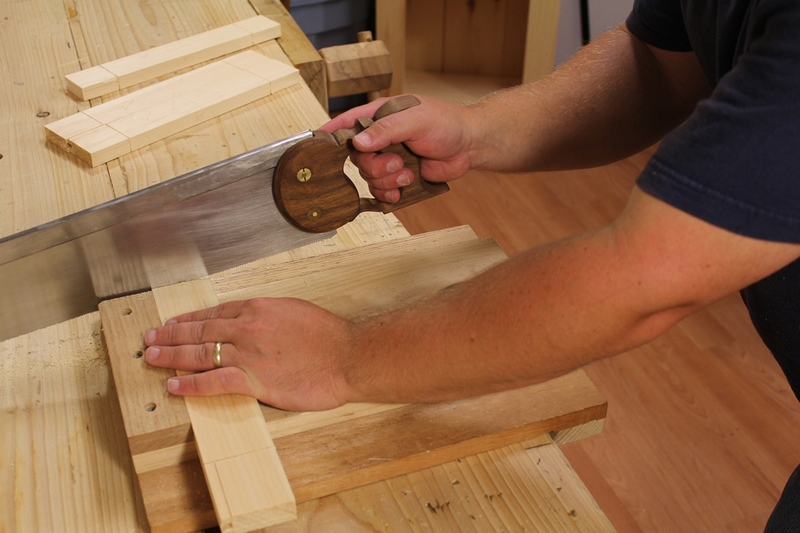 These six saws will do just about anything you need to do in traditional woodworking. You can certainly make do with less, but I wouldn’t be without a single one of them for the work that I do. Posted in Hand Saws, Tools and tagged crosscut saw, dovetail saw, rip saw, sash saw, tenon saw, turning saw. I do agree a 14″ tenon/carcase/sash saw is the most used. I will admit 99% of the time I just use a rip cut saw for everything. Most of my back saws are at minimum 12tp and filled rip. I do have a veritas crosscut carcase saw that gets little use. While I think the saw is great and feels great, I’m a sucker for vintage tools. I also have a hybrid filed back saw that you actually did for me that I do use. For the majority of operations I find that the crosscut saw makes little difference when compared to the rip. I do keep meaning to return to using a dedicated cross and rip for a while to investigate the issue. Using just rip filed saws is certainly a viable option. Tage Frid used nothing but rip filed frame saws for his entire life and certainly made himself quite a name. I’ve done it, but I prefer having some saws filed with fleam. I don’t like ripping with a crosscut saw, but it can be done. And rip saws with big teeth (e.g. 5-6 PPI) require the rake to be really relaxed in order for them to crosscut decently. With such a relaxed rake, they become really slow rip saws, which kind of defeats the purpose. So I’ve come to have separate saws filed crosscut and rip as I feel they each do a better job at their designed task. Since I do all my own sharpening, it’s easy for me to make any changes to the tooth geometry that I want to. I do file my saws now so I change mine too. I never tried ripping with a crosscut. I don’t see much difference between a 12pt rip or cross in joinery. I think my lowest tpi rip saw I would crosscut with is a 9tpi panel saw. Like I said I should go back to using dedicated cross and rip for research purpose!